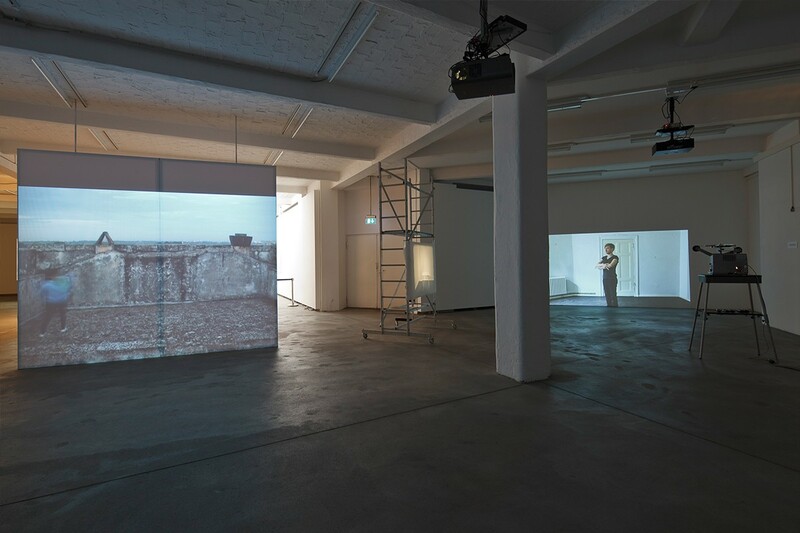 In Berlin, the sea of possibilities for creation and expression is very much prefigured by the artistic energy of the city, and its recent progressive history. As much as this plethora of artistry gives us valuable updates on the novelties, trends and beauty of the world, it can also leave us in a state of confusion. If you’re in Berlin and you’re interested in its art scene, and you also have a thing for street art and public art, keeping your focus on things can become hard, because of the overabundance of everything. 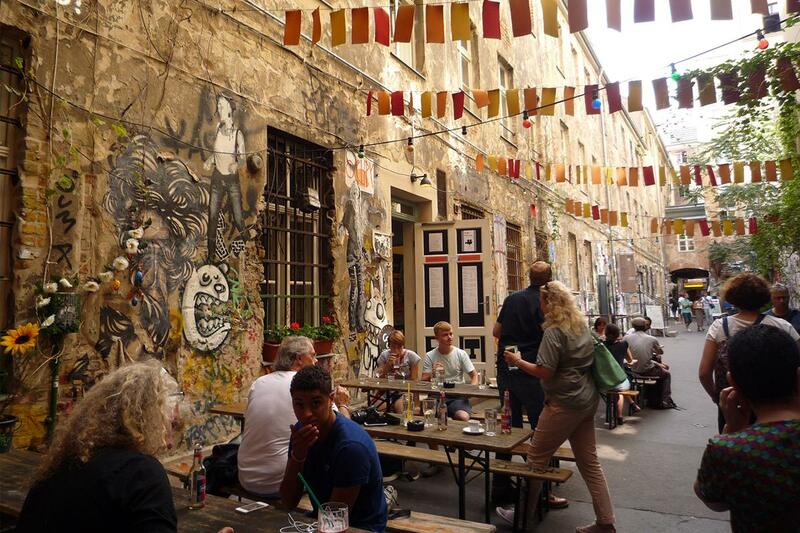 Further on in this article, you will find some interesting suggestions on which places to go to, in order to experience a piece of Berlin’s growing urban art scene. RAW Gelände is an area in central Berlin consisting of a few deserted buildings, which have become a part of Berlin’s traditional urban art scene over time. These buildings belong to Berlin’s industrial heritage, and they stopped serving their initial purpose in 1994. In 1999, these grounds became a sub-cultural center of its own kind, especially important to Berlin’s alternative creatives, graffiti-writers, artists and artisans, but also to all the people who really just love to have fun while doing or witnessing something creative. Among many things that you can find in RAW Gelände, there is an indoor skate park and a swimming pool, and also an improvised climbing wall. The elegant Bethanien building was created as an educational center for nurses and a hospital, back in the 19th century. The hospital was in use until 1970, when the integrity of the building itself was under threat as well. Thanks to several groups of activists, citizens, artists and squatters, the place became a very important cultural institution in 1973, and the building was saved. The architecture of the building gives it a very classy touch, making all the events inside seem more even more important and enjoyable. The quality of their program doesn’t fall far behind, corresponding perfectly with the aesthetics of the place. In a contemporary manner, this remarkable building lends its interior to studios, exhibitions, workshops, events and festivals. With regards to street art – one of the most interesting annual exhibitions is certainly Backjumps, which was mentioned in one of our previous posts, when we were trying to figure out if Banksy was ever in Berlin. It sounds just a little bit unusual at first – finding out about a gallery which focuses on Public Art mainly (since, obviously, Public Art is something that belongs to public spaces). It is no wonder, then, that the gallery is a unique, internationally acclaimed platform, which really offers a remarkable insight into all the things you can imagine related to Public Art. OPEN WALLS Gallery organizes workshops and offers art consulting, and it represents some of the key figures in Public Art, such as Alias, Vermibus, Jordan Seiler, OX, Levalet, Alaniz, etc. The curator of OPEN WALLS is also one the organizers of our Berlin Street Art Tour, a fact that speaks about his genuine devotion, and a true passion for Public Art. 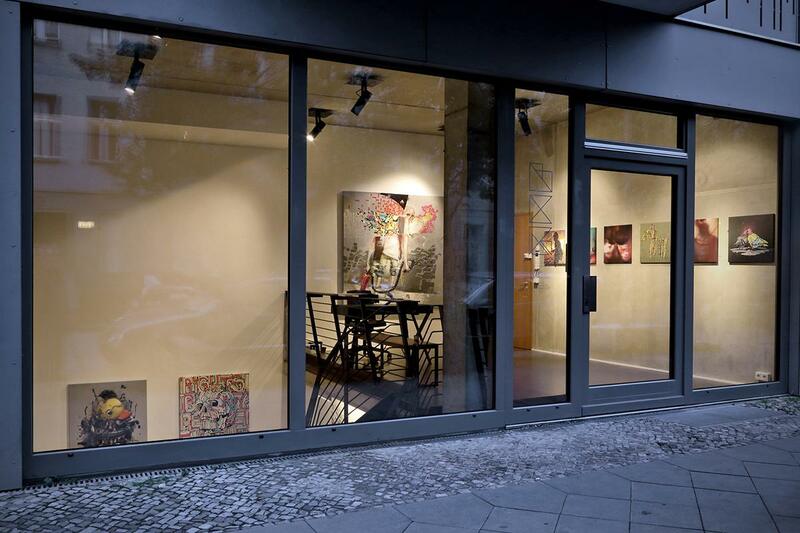 Neurotitan is definitely a linchpin of Berlin’s alternative art scene, which embraces and supports experimental projects, interdisciplinary work and open-minded approach. The gallery started out as an experiment itself, a platform for encouraging the new, emerging or unknown artists and musicians. It hosts various types of events, such as screenings, talks, performances, small concerts and festivals, and it has held around 80 major exhibitions, since 1996. One thing that remains the same is that unbreakable alternative spirit, which aims to soften the boundary between subcultures and the avant-garde, and to warmly welcome all the outcasts of the artistic world. In a relatively short period of time, BC Gallery managed to get in touch with very interesting artists and organizations. It was founded in 2013, and it collaborates with some of the most amazing urban and contemporary artists out there, such as Axel Void, Jan Kalab, Low Bros, Clemens Behr, Stinkfish… To name only a few. Apart from these artists, some of which are established and some are emerging, the gallery is in possession of a few DFace’s works, and prints by Shepard Fairey. All in all, as you can see, it is quite dedicated to promoting and delivering artworks which could fit in into the group of Urban Art. Here’s something very amusing and original – if you’re into stickers (like most of us are), you’ll be especially excited about this particular museum. Hatch Kingdom offers an “escape from planet Boredom”, and gives us a chance to see and enjoy a comprehensive selection of stickers, but also to participate in their exhibitions, as well. 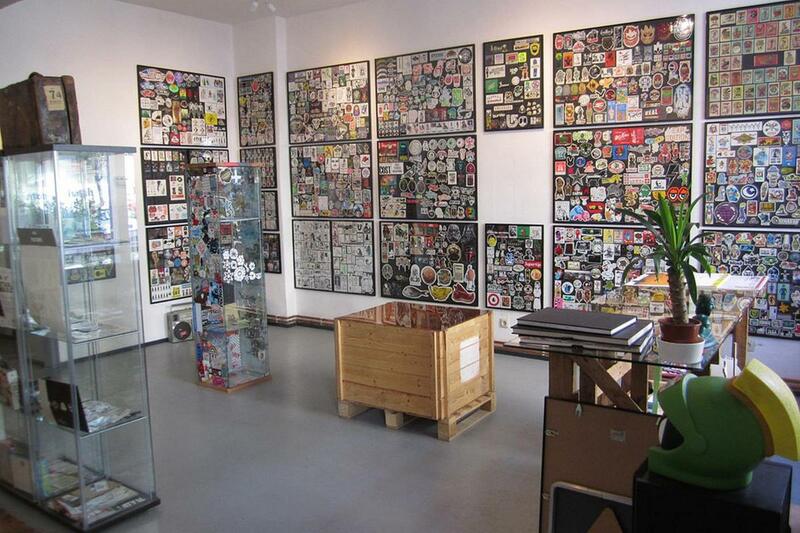 It is the first sticker art museum, something that, in their own words, is a long-overdue realization of a dream. The museum is not far from RAW Gelände, and therefore you can check these two off the list in the same route. Apart from the few major institutions and galleries mentioned above, here is a quick list of some dreamlike places in Berlin, some of which will make you feel like home, and some will take you to another planet. 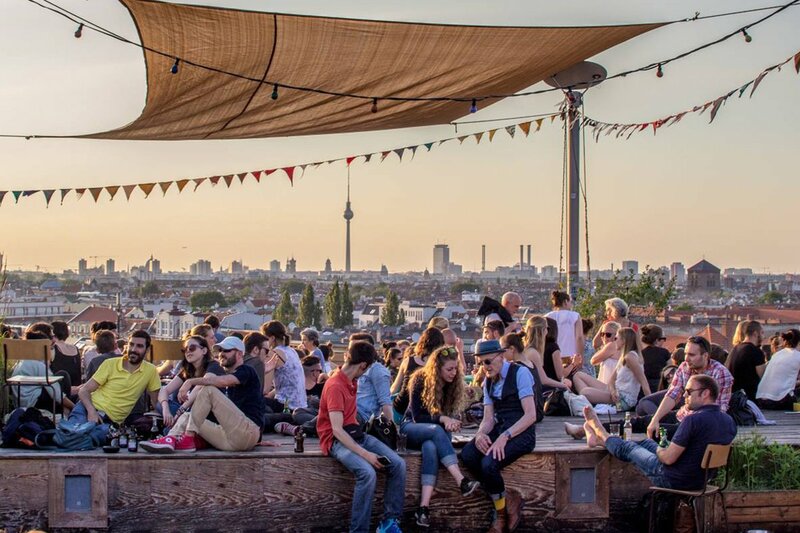 Klunkerkranich – the place is a former parking lot, situated on the top of a building. If this wasn’t interesting enough – take a look at the image from the beginning of this article, and consider the view. Or mind that the place is a bar, and a garden, and a polyvalent creative hub, which hosts readings, performances, screenings… I bet most of you would love to be there right now. Next – Berghain, although I’m pretty sure that most of you have already heard about it, but you may not know that the popular nightclub is a place where you can find some wonderful murals as well. Check out the works by Negative Vibes, next time you go there. Also, if you’re an artist and would like to live and work in Berlin, you should check out ZKU’s program for artists in residence. 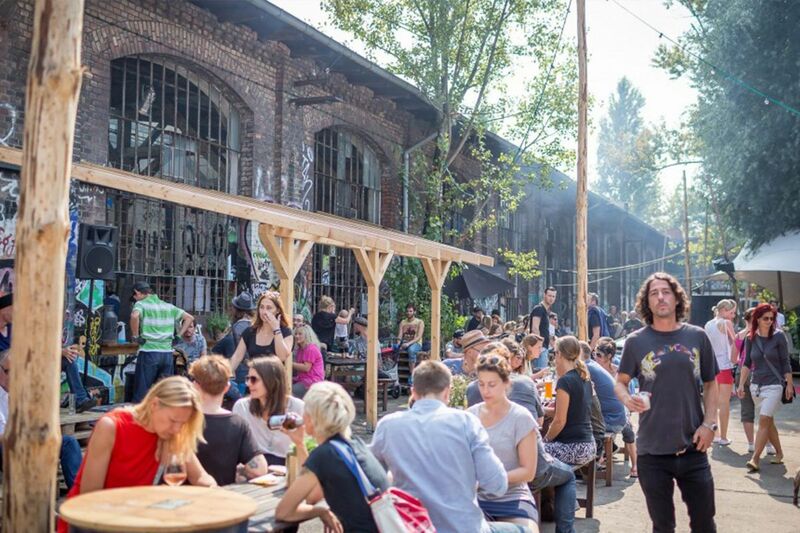 Another interesting creative hub is Kunstfabrik am Flutgraben, which is now known simply as Flutgraben e.V. 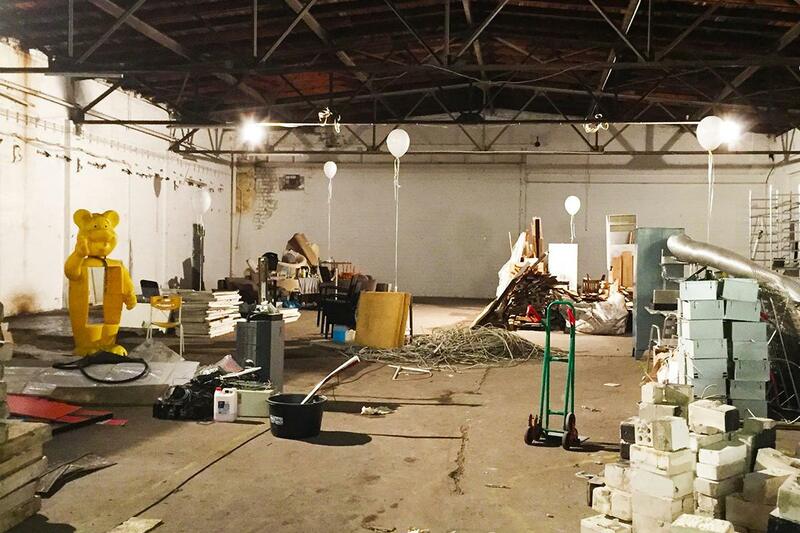 The space is completely independent, non-profit and self-organizing, and it might attract you if you’re into conceptual art, performance, happening, design… Or just about anything constructive at all, really. A place similar to this one is Agora Collective, a recently initiated project, interested in investigating social art practice. Berlin offers so many things, it is hard to concentrate on just a few, but hopefully, these suggestions helped you find the kind of thing you like.